The Miami Heat have done it again. 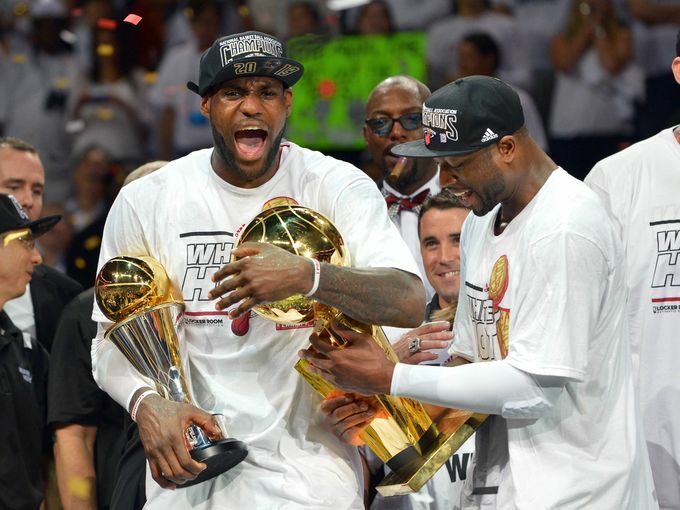 For the second season in a row, LeBron James and Heat are NBA champions. James poured in 37 points in the winner-take all 2013 NBA Finals finale as the Heat outlasted the San Antonio Spurs 95-88 in a thrilling Game 7. With that shot of adrenalin, James stole the ball on the next possession, made the free throws and secured the victory. These are his kind of moments. "He probably lost 12-15 pounds in this playoff run, expending so much energy," said his coach Erik Spoelstra. "It took everything we had as a team, credit to the San Antonio Spurs," Dwyane Wade told Doris Burke of ESPN on the floor after the final buzzer. "They are an unbelievable team, unbelievable franchise. This was the hardest series we ever had to play but we're a resilient team and we did whatever it took." What it took, was a classic performance from James, 23 points and 10 rebounds from Wade and an incredible effort from Shane Battier, who scored 18 points and shot 6 out of8 from beyond the arc. Although Chris Bosh was held scoreless by the Spurs in Game 7, Battier and Mario Chalmers combined for 32 points. "It's better to be timely than good," Battier quipped to Burke as confetti fell following the presentation of the Larry O'Brien Trophy. Prior to his stunning Game 7 performance, Battier had managed just 21 total points in the previous six games. Despite the presence of a "Big Three" in each lineup, it was Chalmers who delivered one of the most devastating blows in the seventh round of the classic Finals bout. With time winding down in the third quarter and the Spurs holding a narrow 71-69 advantage, Chalmers gave the Heat the lead for good with a deep, three-point shot that just beat the buzzer. "It feels great, a dream come true," Chalmers told Rachel Nichols of ESPN of his second championship in the champagne-soaked Heat locker room after the win. "We worked hard to get to this point. We had to leave it all on the court tonight." Although the Heat never relinquished the lead after Chalmers' improbable, buzzer-beating bank shot, Tim Duncan and the Spurs relentlessly challenged down the stretch, withstanding nearly everything that the Heat could throw at them. Nearly. Having come within seconds of closing out their fifth title since selecting Duncan as the No. 1 overall selection in the 1997 NBA Draft in Game 6, the Spurs closed within two points in the final minute of regulation in Game 7. With the Heat clinging to a 90-88 lead and less than a minute to play, Duncan got the ball on the block. With Battier on his hip, the 37-year-old spun to his left and got off a point-blank, right-handed hook shot in the paint. Unlike so many of the shots during his illustrious career, it missed. Reacting quickly, Duncan got his right hand back on the ball, tipping it up toward the rim. He missed again. "The obvious word is 'disappointing.' Tough end to the game," Duncan, who finished with 24 points, 12 rebounds, 4 steals and 1 block, told reporters after the game, via ASAP Sports. "Made some bad decisions, missed some shots. I don't know what to say. Just give credit to the Miami Heat. LeBron was unbelievable. Dwyane was great. I just think they found a way to get it done. We stayed in the game. We gave ourselves opportunities to win the game, we just couldn't turn that corner. They made more plays down the stretch, bottom line"
Miami Heat receive Finals Trophy & LeBron is Finals MVP! 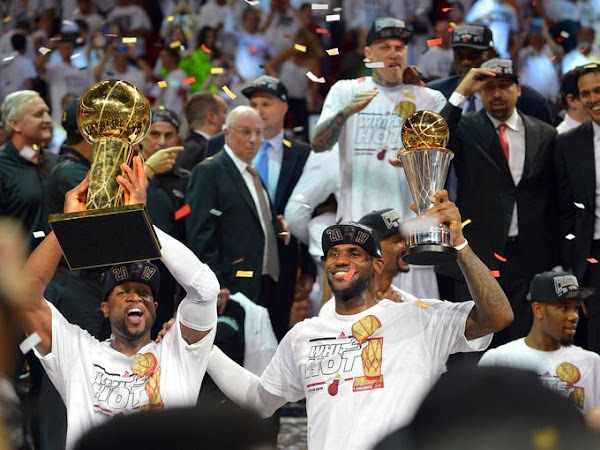 Heat is now becoming a new 'Dynasty' after winning this back to back NBA Championship.